Not as big of a celebration over here. Very optional participation. Costumes = frightening & gory. Lots of face paint: white faces with dark, sunken-in eyes and blood-red accents. I celebrated Halloween at the Vauxhall Pleasure Gardens Fire Festival. Turns out this is not really a Halloween celebration at all– more like a pre-game for Guy Fawkes and Armistice Day. No Monster Mash or Thriller, but a nice jazz rendition of Katy Perry’s Firework seemed oddly fitting. Perhaps this is an effect of large cities and smaller personal bubbles, but the fireworks were shot off much closer to the crowd than would happen at a public event back home. I’d bet that the people up front had to comb a good bit of debris out of their hair. Typically a holy day of obligation within the Catholic Church, since Nov 1 fell on a Saturday festivities were lumped in with the Sunday mass on Nov 2. …and since All Saint’s Day was pushed back, so was All Soul’s Day. This service was of special significance because of the sudden loss of a KCL’s renowned choir director, David Trendell, the week before. Choir alum joined the regular choir doubling its normal membership for that evening. A truly remarkable service. It’s kind of crazy walking past main landmarks in V for Vendetta. Between the poppy display at the Tower of London and the Poppy Appeal that has been going strong for the last few weeks, this feels more like a season than a 24 hour holiday. The Sunday closest to November 11 (this year– Sunday, November 9) is called Remembrance Sunday. I was out of London for this weekend, but I was told that there are some very proper services. At the church service I was attending in Cornwall, there was a moment of silence at 11am followed by special prayers for veterans. Many thanks to all veterans (with a special shout out to my dad!) for the sacrifices you have made in serving our country. HostUK is an awesome program designed to give international students a “real” taste of Britain. I signed up at the beginning of the year and after completing form (something that I imagine would resemble an eHarmony profile) was matched with a lovely couple in Cornwall. My host mother’s background was in healthcare, ergonomics, and nutritional medicine; my host father was a semi-retired engineer, music enthusiast, and excellent cook; and both enjoyed outdoor activities. Win, win, win. Something to be said for those matching algorithms! Cornwall is ~4.5 hours SW of London and since it is on the peninsula it is blessed with weather that blows in from both coasts. Translation: it rains a LOT. And although a newcomer may initially focus on her thanksgiving for packing an umbrella, it doesn’t take long to realize that this rain is necessary for rainbows and green pastures. A good life lesson. The following pictures will give you an idea of my weekend. The captions will be described by their location on the clock/collage. – 1:30 — Putting the window down seemed like a pretty good idea to take this photo… until the rain picked up. The smudges in this photo are from raindrops hitting my camera… and me, and all of the inside of the car. Oops. – 3:00 — Golitha Falls. Only snapped a picture from the entrance. The road was flooding when we came in, so we didn’t stick around here very long. – 7:30 — Hedges & winding roads are a signature feature in Cornwall. This is pruning season, but as shown in this picture, some of them haven’t had their grooming appointment yet. I’m told that these hedges are covered in flowers. – 10:30 — On the road again, now with some glorious sunshine! – 1:30 — We saw **FIVE** rainbows at Padstow. Not 1 rainbow that was covered and uncovered by clouds 5 times. Five rainbows that showed up at different parts of the sky at different times throughout the day. Is this real life?? – 12:00 — One of our big adventures was going to the Eden Project, a really cool sustainability / educational project that has developed into its current flourishing state over the past 15 years. Read more about it on their website. – 1:30 — taking a rest on the tire bench in the Rainforest Biome. – 6:00 — An overview of the whole area. The white bubble-ish things on the right are the biomes. – 10:30 — My host parents taking a swinging break. – 12:00 — The outdoor cafe. The table centerpieces are made from old pots and pans and feature quick facts about the environment and sustainable living. – 1:30 — Tobacco facts from the Mediterranean Biome. – Center — A picture of the quarry used to be here before the Eden Project was developed. 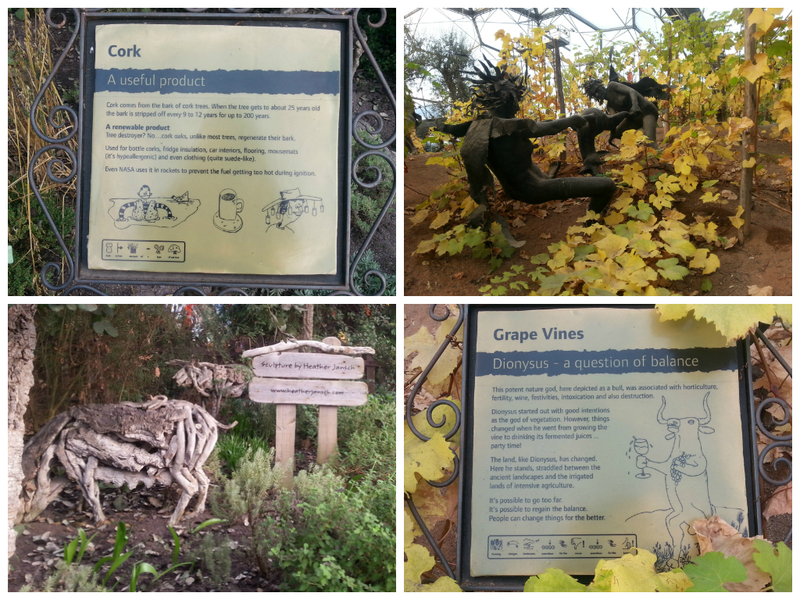 Other snapshots from the Eden Project. Note, the description of driftwood provided at 10:30 corresponds to the horses shown at 7:30. The bucket displays shown at 4:30 and 6:30 are from the water conservation display. 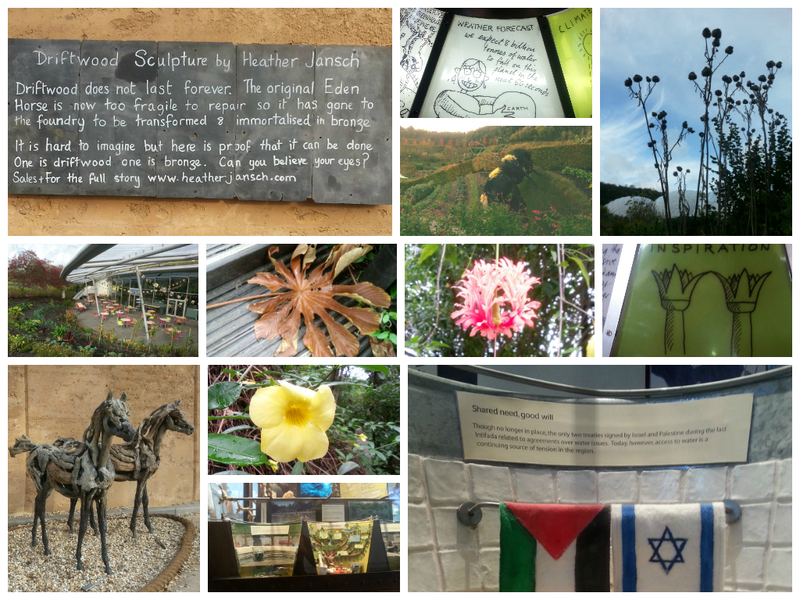 A few of my other favorite pictures from the Eden Project. The pigs (7:30) are indeed made of cork (description at 10:30)! – 1:30 — …which was demonstrated throughout the weekend, especially around the table. My favorite dish was a lentil lasagna which featured homemade noodles made with almond flour. I wasn’t kidding when I said my host father could cook. YUM. – Center — Quintessential panoramic from Cornwall. 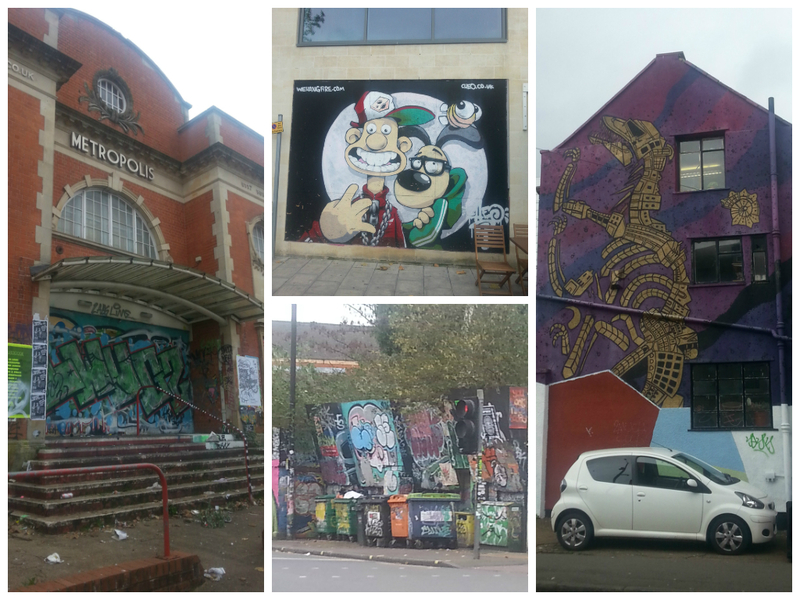 Quick snapshots from Bristol! This trip was planned as a detour en route to my Host visit in Cornwall, so it was only 6 hours long. On three separate occasions people came up to offer help. I’d like to think I don’t look that helpless, but I suppose looking at bus routes or consulting a map in a small-ish city is a good indicator. Not only did these people stop to ask if I needed help, they even offered to go out of their way to walk to a key intersection or otherwise point me in the right direction. I’ve made a habit of being rather self reliant in London. Even if I did ask for directions, there is a pretty good chance that the person may not know where Such-n-Such place is because (a) London is so vast and (b) there are so many “transients” (people like me that have just moved here, tourists, etc) that you may end up asking someone who is more lost than you are. Beyond that though, the pace of life in London is faster. If someone is power-walking in a tailored suit and heels, she is probably not going to want to break stride to see if you need help. No time for that. 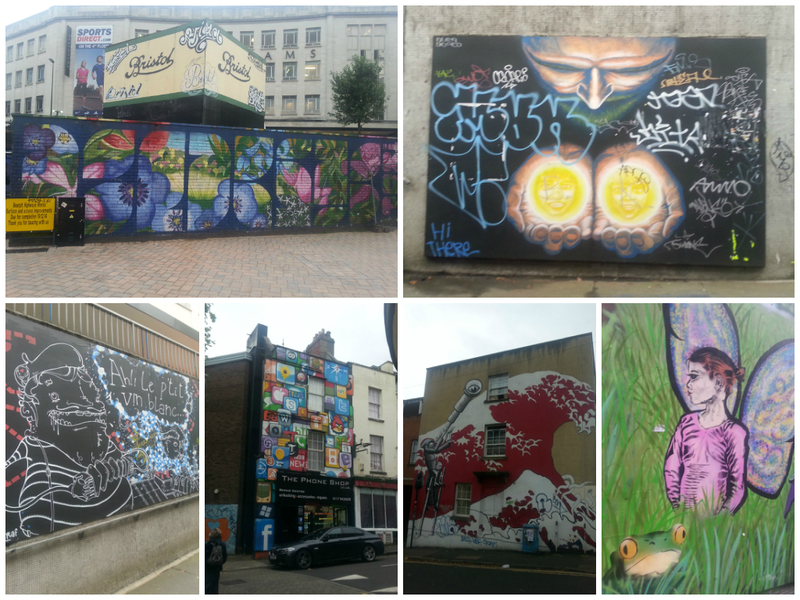 Strolling the city. 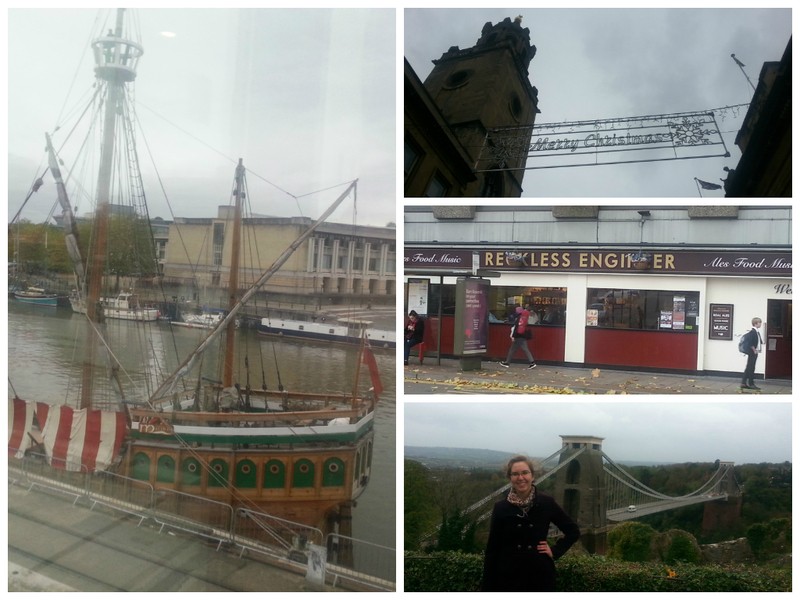 Clockwise from top left: 1 The bankside; 2 St Nicholas Market; 3 A pub that would have fared well in A2; 4 Clifton suspension bridge– celebrating 150 years! 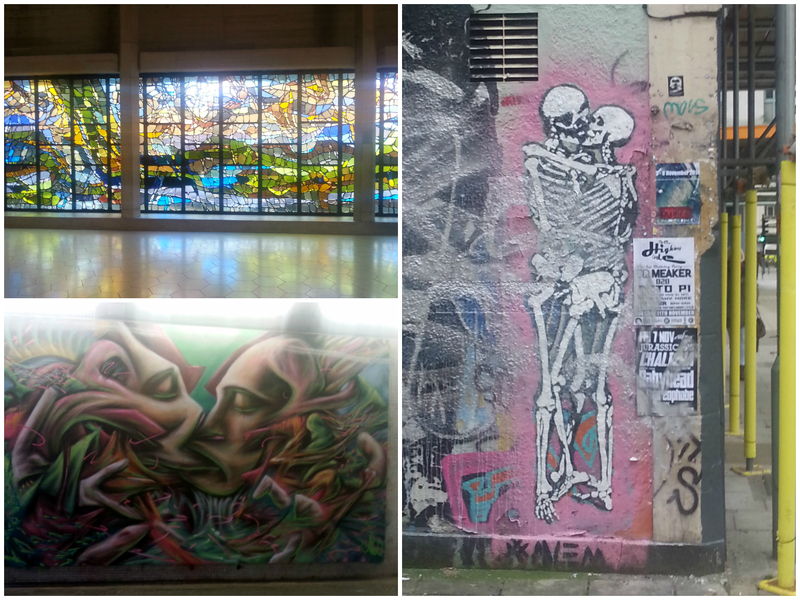 The left panel features 2 pieces by Banksy— Mild Mild West & Golden Earring. Stained glass window is from Sts Peter & Paul Cathedral. 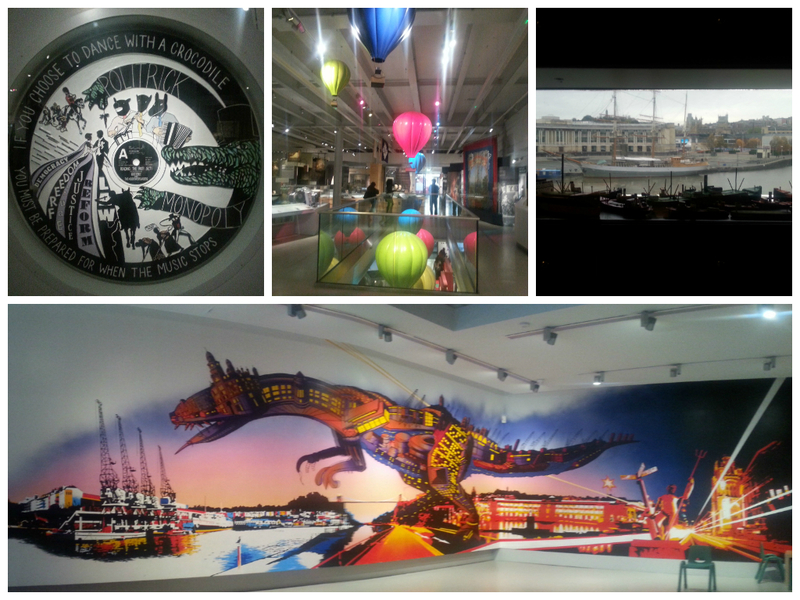 Snapshots from the MShed. Top center is represents the annual hot air balloon festival that Bristol hosts. 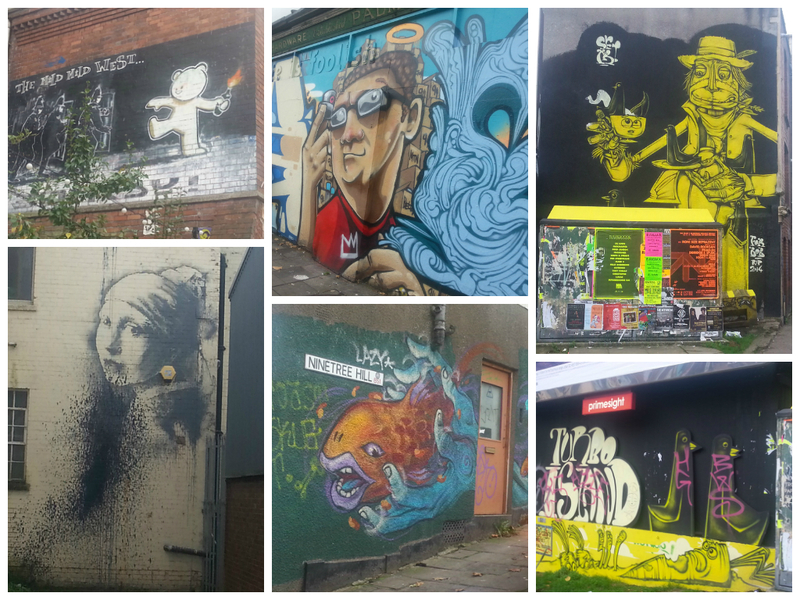 A final sampling of my favorite street art. Most people don’t get excited to take a visit to the doctor’s office. I, however, considered it quite the opportunity. Since I am a full time student in the UK, I am “entitled to National Health Service treatment” and was curious to see how treatment would vary from what I had previously received back home in the States. This is by no means an official comparison of the systems, but I thought it would be interesting to share my first impressions. To register, I took a 10 minute walk to my “local surgery” (the neighborhood clinic) and filled out 10-15 minutes worth of paperwork: name, address, have I previously registered with the NHS, have I received treatment in other countries, etc. I turned it in and was told that it would take 24 hours for the paperwork to be processed, a requirement for making an appointment. I phoned ~25 hours after submitting my paperwork and was delighted to hear that I was in their system AND that I could have an appointment the following afternoon. Receptionist: We have 14:10, 15:40, or 15:50 available. Me: 15:40, please, that fits in perfectly after class. Receptionist: Ok, you’re all set. Me: Oh… ok. Thanks… Um, did you need my chief complaint? Receptionist: No, you’re all set. I arrived for my appointment ~15 minutes early and took a seat in the waiting room. This feels like home. 🙂 Someone from the surgery would open the door to the visiting rooms every 5-7 minutes and call a patient back. Almost exactly at 15:40, a young man (couldn’t have been more than 3-4 years old than me) in a button down shirt, dress trousers, and of course London approved supah-nice dress shoes opened the door and called my name. Hyperaware of my polka dot wellies, I picked up my purse, walked over to him, and was directed toward the first room on the right. As a new patient, I was anticipating that there would be a medical history or basic physical exam incorporated into the visit, but perhaps he had read through my registration paperwork?? Dubious. A significant portion of that registration medical history focused on which, if any, family members had been diagnosed and treated for high blood pressure, diabetes, or other high profile illnesses. I’m not sure what I had expected to happen in those few seconds of mind-overdrive, but when I finished my internal commentary, I was still uncertain how to answer the question. And he was still looking at me with a smile awaiting my answer. “My lower back…” I offered cautiously, making sure I had started along the correct route before it was too late to turn back. He nodded reassuringly, so I continued. After 3 minutes, I was given reassurance that I was taking care of myself in a reasonable manner. He also provided me with a paper that had pictures of people demonstrating different back exercises (most of which I had already been doing) and gave me an opportunity to request a prescription. GP: A non-steroidal anti-inflammatory prescription drug. me: I see… (Unsure if he had intended for his answer to sound condescending, I opted out of describing ibuprofen as a non-steroidal anti-inflammatory over the counter drug.) And do you think I will respond any differently to it than I have been responding to ibuprofen? me: Ahh. I see. Well, then no thank you. I think I’ll stick with ibuprofen. me: Oh, do I need to check out with reception? GP: No, no. You’re all set. me: Ok, well… (I guess that makes sense if there isn’t a chart or copay!) Thank you. *This was in reference to an exchange we had shared a minute earlier. Fun fact: in the UK, the max recommended daily dosage for ibuprofen is 1200mg as opposed to 2400mg in the US. You are also limited to buying 2 blister packs (where each pill is stored in it’s own individual foil compartment) with 16 pills X 200mg. I’m no ibuprofen addict, but I wanted to buy a pack to keep in my purse, backpack, and desk… and was turned down. **Although a prescription may have been more convenient, it certainly would have been more expensive. Under the NHS, the flat rate would have been £8 compared with £0.32 per 16-pill OTC blister pack. Before any fights breakout, let me remind you that this is 1 anecdote. Two points are required to make a line, and hundreds if not thousands of points are required to draw conclusions. Rather than attempting to compare US vs UK health systems with very little data, I spent most of my reflection time this week thinking about the way this experience fits into what we have been discussing in my Foundations of Social Science, Health, and Medicine (FSSHM) class. “A renowned professor is forced to reassess her life when she is diagnosed with terminal ovarian cancer” (IMDb). My thoughts: A very moving story. Some aspects border on becoming a caricature, but as with any caricatures there is as aspect of truth to be seen. I have experienced this type of “treatment” and I’m sure a number of you have as well. It pains me to know that situations like this exist, but I find encouragement by interacting with physicians that actively fight this frightening stereotype. “Modern medicine is in danger of losing a powerful, old-fashioned tool: human touch. Physician and writer Abraham Verghese describes our strange new world where patients are merely data points, and calls for a return to the traditional one-on-one physical exam” (TED). Many thanks to Dr Behrouzan (one of my FSSHM lecturers) and Zoe Walters (amazing friend and current pharmacy student) for recommending these to me!